In primitive countries trading was monopolized by traveling merchants. Palestine, an agricultural country, knew the traders mostly as foreigners, chiefly Canaanites (Hosea xii. 8; Isa. xxiii. 8; Prov. xxxi. 24; Job xl. 30). The Hebrew uses either (Gen. xxiii. 16) or (I Kings x. 25; Ezek. xxvii. ; Cant. iii. 6), both of which mean originally "the wanderer." 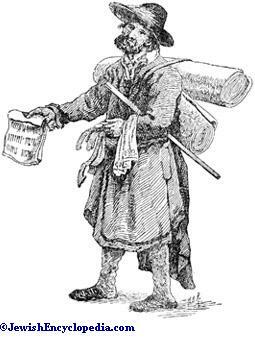 A version to the foreigner, and the narrow prejudices of the farmer, who considered the profit of the merchant ill-gotten, combined to represent the hawker as dishonest. Hosea speaks of the trafficker in whose hands are "the balances of deceit" (xii. 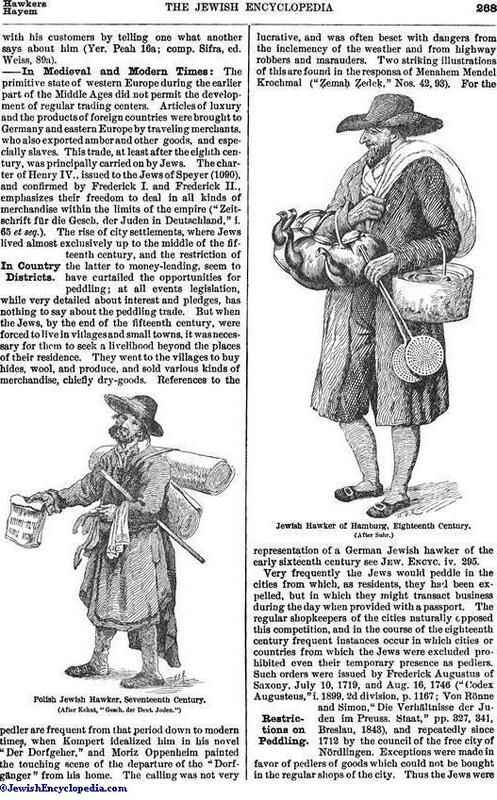 8 [A. V. 7]); and the term for "slanderer" ( ) meant originally a "traveling merchant" (Prov. xi. 13, xix. 16). The same idea appears in the verse "A merchant will hardly keep himself from doing wrong; and an huckster shall not be freed from sin" (Ecclus. [Sirach] xxvi. 29). The articles in which the pedler dealt in those days were evidently manifold. 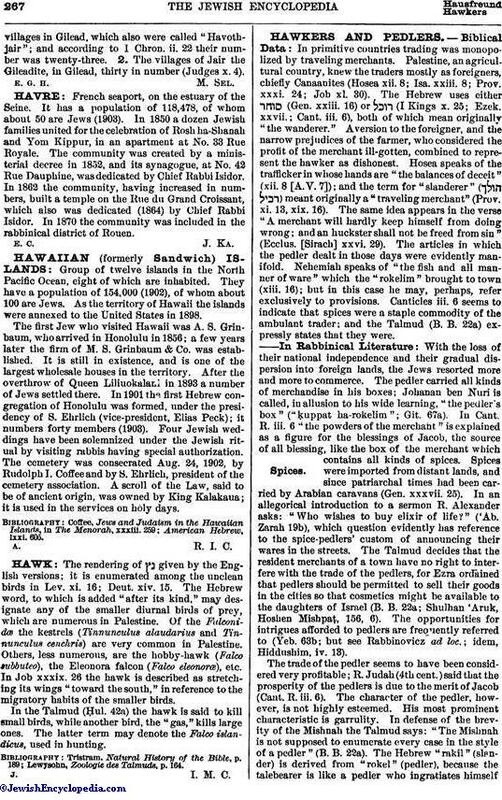 Nehemiah speaks of "the fish and all manner of ware" which the "rokelim" brought to town (xiii. 16); but in this case he may, perhaps, refer exclusively to provisions. Canticles iii. 6 seems to indicate that spices were a staple commodity of the ambulant trader; and the Talmud (B. B. 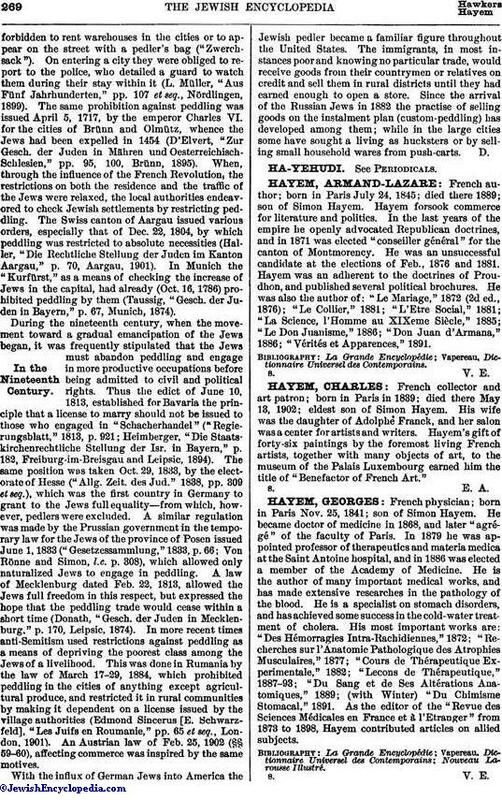 22a) expressly states that they were.